If there's one thing we're aiming to do this summer, it's wear more sunscreen. But, as many of you have pointed out, the kind of sun block could make a big difference for your skin. Whether it's shielding you from the sun's rays physically or chemically, sunscreen — like everything we slather on — shouldn't cause more problems than it solves. So, how do you tell which is the best kind? The first step is determining the difference between the two major sun-protection categories. According to Dr. John Salerno, MD, dermatologist and director of The Salerno Center in New York, "Physical sunscreen deflects the sun's rays, while chemical sunscreen absorbs them." But, the two might not be created equally: "Physical sunscreen is generally better tolerated on those with sensitive skin, as chemical sunscreens have toxins in them which can be absorbed and can cause allergic reactions on the skin level," he says. However, not all experts are in agreement. Dermatologist Doris Day is skeptical that chemical sunscreen is harmful and says they should all be safe to use. "Sunscreens are drugs, meaning they're regulated by the FDA. Anyone who wants to label a product as sunscreen has to go through specific testing for safety and efficacy [in the United States]," Dr. Day tells us. "So, if you have a bad reaction to a chemical sunscreen, it might be a reaction to one of the other ingredients, like a preservative. It's highly unlikely that you're reacting to the true sunscreen." Dr. Day advises switching brands or getting a patch test to determine if you're truly allergic. Another misconception has to do with what makes something chemical or physical. Physical sunscreens contain zinc oxide or titanium dioxide, and chemical sunscreens contain micronized ingredients like avobenzone, Dr. Day explains. As for the belief that natural, physical sunscreens are the ultimate way to go? "People think that if it's natural rather than chemical, it means it's better. But, poison ivy is natural, and I don't see anyone rubbing that on their skin," she says. Point taken. All that said, at the end of the day (or the beginning, if we're talking about when to apply), the most important thing is that you wear sunscreen. If a chemical product doesn't feel good, just use a physical one, and vice versa. So, since we've already told you what we'll be using this summer, let us know what your favorites are in the comments. Supergoop! 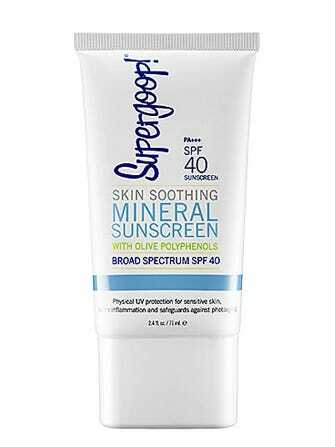 Skin Soothing Mineral Sunscreen Broad Spectrum SPF 40, $28, available at Sephora.